The high-end phablet will have rear buttons; support nano-SIM and microSD. With only a day to go until LG’s international media event in New York City, a French technology blog has published an alleged user manual for the highly anticipated G2 phablet. The purported manual both confirms and denounces some of the latest rumors swirling around the spec’d-out G2. The uniquely-placed buttons on the back of the device’s casing are present in the manual, going along with the deluge of leaked images that surfaced last month. The manual, which is printed in Hangul (Korean characters), notes that the rear buttons are for volume up, volume down, and power. There is no fingerprint scanner, as some tech blogs had previously suspected. The LG G2 will also take the tiny nano-SIM card, “making the G2 only the third Android phone to support this standard (After the ASUS Padfone Infinity and the recently-announced Moto X),” according to AndroidCentral. The iPhone 5 was the first handset to adopt micro-SIM, the smallest iteration of the SIM card. According to the manual, the LG G2 will also sport a microSD card slot for additional storage and a replaceable 2610mAh battery. TalkAndroid also pointed out that the G2 will be bundled with high quality headphones, the Quadbeat 2. “Bass will be deeper, beats will be more natural, and peak sounds will be better managed, with less distortion,” the blog stated. They are alleged to be “a step up” from the original Quadbeat headphones that came with the Optimus G and G Pro. Earlier this month, LG also announced that it was dropping the Optimus moniker from its smartphone offerings. The South Korean company has chosen to release the flagship G2 as the first member of the “G” series of premium handsets. “Our vision is to make LG's newest G devices synonymous with excellence, raising the bar even further for the ultimate in user experience,” said Jong-Seok Park, LG Mobile Communications CEO, as reported by CNET. 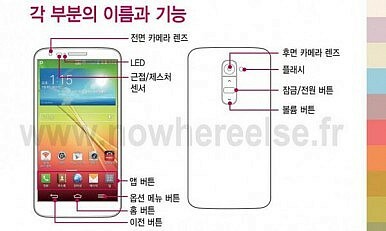 LG’s newest flagship is anticipated to contain a Snapdragon 800 quad-core CPU clocked at 2.3GHz, coupled to a massive 3GB of RAM. AndroidAuthority claims that the G2 appeared on the AnTuTu Benchmark ratings page less than a week ago – posting the highest score for a smartphone by nearly 10,000 points compared to current offerings. “The LG G2 – under the codename LG-D802 – recently showed up on AnTuTu Benchmark with a very impressive benchmark score of nearly 30,000 points. Given that the current high score on the AnTuTu Benchmark ratings page sits at just a bit over 20,000 points, the LG G2′s performance is certainly going to be hard to beat,” AndroidAuthority said. It will also feature a 5.2-inch full-HD screen, a 13MP camera, and Android 4.2.2 Jelly Bean. Expect the full range of high-end features to be confirmed at LG’s big reveal in the Big Apple. Report: Inside sources release a sketch of LG’s G Flex prototype.